During the Middle Ages, links between things based on appearances were codified by the Doctrine of Signatures. Walnuts, for instance looked like, or carried the “signature” of, brains. Much later “The Order of Things” was the name of a late-twentieth-century book by Michel Foucault that likewise found epistemological coherence, that is, investigated the underlying connections between the manner in which social structures frame our perceptions and shape representations and habits of mind. Judith Belzer also conducts her inquiry, using paint and other graphic materials, into the order of things—how natural processes create patterns that, once exposed, speak of the underlying and connective structures of life. 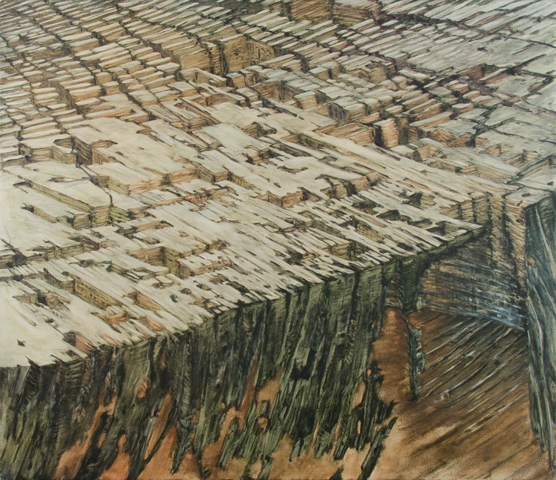 Several paintings from a sequence titled “Cracks and Fissures” take deterioration in horizontal (lateral) sections of tree trunks as their source. The subject of these works seems for a moment to have something to do with their resemblance to landforms and the organic patterns that appear in maps of cities. Tree rings evoke time. Despite these connotations, the paintings work because they don’t become symbols of something else. The visual associations hover and shift but don’t ever take over Belzer’s studies of the patterns produced by rain, sun, insects and microorganisms on wood. Through June 5 at Valerie Carberry Gallery, 875 N. Michigan.